From our print archive: Lots of clever images make up the big picture—a cartoon charting of the University’s first four decades. In 1933, when the city of Chicago cele­brated its centennial with an exposition billed as “A Century of Progress,” the University of Chicago had only 40 years of progress under its belt—a lifespan that dated to the city’s first great fair, the Col­umbian Exposition of 1893. 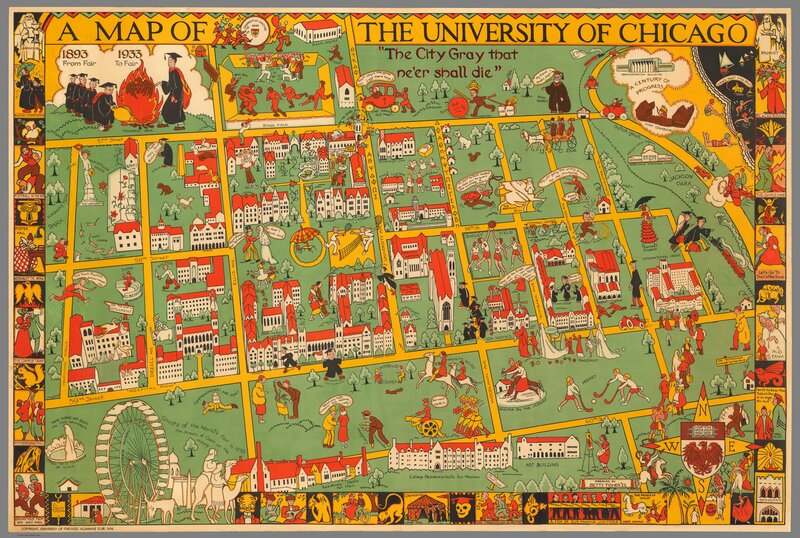 Every fair has its share of souvenirs, and among the many generated by the 1933 event was a comic relief map of the quadrangles, showing not just the 80-odd buildings that had sprung up since the University’s founding, but also something of the life that those buildings had housed. A short and boyish William Rainey Harper fans the flames as a phoenix struggles to arise -while a tall and boyish Robert Maynard Hutchins appears about to get his fingers burned. A baby’s cradle perches on top of the Lying-in Hospital, and James H. Breasted chases his famous find, the Assyrian Bull, across campus, his lasso roiling as he calls out, “Hi, don’t be bullheaded. We need you to guard the mummies in Oriental.” There’s Botany Pond, and the IFC Sing in Hutchinson Courtyard, and skating on the Midway. And sketched into the Midway-just to the east of the yet-to-be-built women’s residences and art studio-is the artist herself. Elizabeth Moore (“Betty”) Fisher, PhB’22, worked in the lantern-slide department of the Art Insti­tute and illustrated children’s books. In the early 1930s, she was also the official cartoon­ist for the Century of Progress. Her map was the brainchild of the Universi­ty’s Alumnae Club. The four-color map (“es­pecially adapted for use as a wall decoration”) was sold for $1.00 at the University Book­store and Woodworth’s Bookstore on East 57th Street, with profits going to the Alumnae Club’s scholarship fund. Today, there are only a few dog-eared and somewhat faded copies to be found. Download a high resolution scan of the cartoon to print your own poster or update your desktop wallpaper.